Bethany Bowes | Perry & Carroll, Inc. In 2004, Bethany joined Perry & Carroll, Inc. as an Account Manager in the Personal Lines Department. She became interested in expanding her insurance knowledge, and in 2007 she moved to the Commercial Lines Department where she has worked since. With the majority of Bethany’s accounts being contractors and manufacturers, she has gained a wealth of knowledge in these areas. 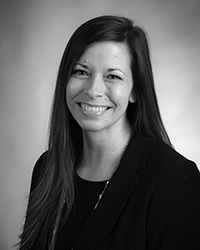 Bethany holds several designations, including Accredited Advisor in Insurance Services and Certified Risk Manager. Graduating from Corning Community College in 2002 with an associate degree in Business Administration, she has found her home in the insurance industry. Bethany’s experience includes positions with The Arizona Group in Phoenix, AZ and Perry & Carroll, Inc.
Bethany has a love for animals and regularly volunteers in the community.